In a skillet over med. high heat brown the ground beef and drain the grease. Stir in the onion and cook till tender, 4-5 minutes. Reduce the heat to medium and stir in the chili powder, garlic powder and a splash of worcestershire. Add the tomato sauce and ketchup, combine well and taste for seasoning of salt and pepper. 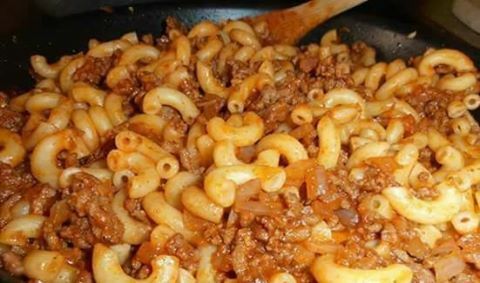 Stir in the cooked macaroni and combine well just before serving.